Joichi “Joi” Ito is perhaps best known as a successful Internet entrepreneur, venture capitalist, and activist. In 2011, he became the fourth director of the MIT Media Lab, a celebrated multimedia and technology research laboratory at the Massachusetts Institute of Technology in Cambridge, Massachusetts. For more than three decades, the Media Lab has incubated the minds behind some of the most widely used technology tools, including e-ink and low-cost laptops. As technology and connectivity continue to change ever more rapidly, Ito laid out nine core, practice-driven principles to guide the Lab’s continued innovation. 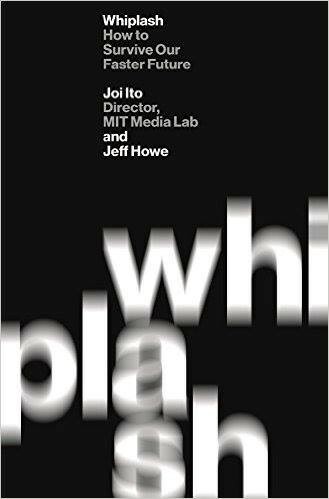 With Wired reporter Jeff Howe, he’s put those principles into a book. Whiplash: How to Survive Our Faster Future is a sort of survival guide for tumultuous times of great invention and imagination, built on fascinating case studies and research and peppered with philosophy. In a recent interview with Slack, Ito elaborated on some of his favorite themes in the book, including why disobedience can lead to Nobel Prize-level discoveries and why collaborative projects like Wikipedia are a lot like filmmaking. Slack: You write, “Of all the nine principles in the book, compasses over maps has the greatest potential for misunderstanding.” What do you mean by that? Slack: How is the principle of compasses over maps relevant in the workplace? Ito: Compasses is really a high-level way of saying values, and maps are like architects or plans. Values are reflected in culture, as well as in plans. [Author and educator] Peter Drucker said, “Culture eats strategy for breakfast.” I love that quote because that’s what I’m saying in a slightly different way. You can have all the strategy in the world, but unless your culture points in the right direction, you won’t go anywhere. Plans used to work a lot better, by the way! That’s the point of the book. When we all followed Euclidian methods, we could plan better. Now we have things like agile software development, for example, in which you might have a general goal or direction, but you don’t know exactly what you’re doing until you’re testing and iterating. Constant questioning is also supposed to be built into science, but it isn’t always applied. For a while, people will think we know everything about bacteria, but suddenly, it’ll turn out that we’re wrong. There are areas where we put things to bed for a while, but that’s also where people win Nobel Prizes, in areas where people stopped questioning. Slack: In the chapter about disobedience over compliance, you use the phrase “You don’t win a Nobel Prize by doing as you’re told.” What’s your definition of responsible disobedience, or what you describe as disobedience with a conscience? Ito: It’s often difficult to figure out if disobedience is bad at the time it’s taking place. The people behind the Boston Tea Party? They didn’t know either way. In retrospect, we celebrate them and what they did. Disobedience is a risky business. But if not for disobedience, we wouldn’t have discovered the theory of relativity, or that the Earth rotates around the sun, and we wouldn’t have had the civil rights movement. Disobedience is like evolution. Democracy, science, and law depend on people to be disobedient so that we can continue to evolve and adapt to the times. Disobedience is not automatically a net positive. It’s a painful thing, but we gotta do it, or we’re gonna stagnate. Brittany Shoot briefly worked as an assistant in the Media Lab during grad school. How do we re-imagine the now? See what’s next for Slack.